This SERPA holster from Blackhawk is designed to provide professional-grade retention while still allowing a rapid draw under pressure, so you don't have to sacrifice tactical effectiveness for safety. The SERPA Auto Lock System engages automatically when you return your firearm to the holster. Without snaps or hoods to get in the way, you can draw extremely quickly when required. The lock can be disengaged with the index finger during an instinctive draw motion with a full master grip, a technique that applies to all SERPA holsters. The manually activated Pivot Guard takes the holster from Level 2 to Level 3 retention, and can be engaged for additional security or disengaged for quicker access. The holster is made from durable injection-molded carbon fiber composite, making it extremely strong without adding excess weight, and its full-length body protects the rear sights from damage. Awesome, sticks out a little far but great. Just wish it was a little more adjustable. 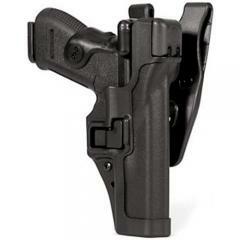 Great holster, I have a level 1 Serpa that I have been using for years. This level 3 is not as adjustable. Holster is just what I wanted. I am very please with the hoster. Best holster I've ever had. 3LVL definitely make my job safer Highly recommend this holster to any officers. Very good holster, would recommend to anyone. Fits perfect for glock 22, very happy. These are the best duty holsters on the market for a police officer. I had one for my Glock and loved it. This fits my Springfield XD 4" full size 45ACP (service model) like a glove. Easy in, easy out (and quick), but secure, protective, and nice looking. It locks onto your duty belt with tightening screws so it doesn't slide around when you take your belt on and off. Very VERY nice! Lots of security that the officer can quickly deactivate for a quick draw. Recommended to all of my friends. Works great. Fits the glock 19 perfect. But the retention on the top was a bit stiff had to work it a little bit and oil it works great now. Greatest holster I've ever used. It's great for Springfield Armory 1911 that I carry for service. Works great and it fit my 92FS right out of the box. I wish they made them to fit an XD with a 5 inch barrel, but the holster itself is perfect. Quality holster for the best price. If your looking for a top quality bolster to keep your gun safe and for a fast draw this is the one for you. Awesome holster level 3 protection without the added worry of a thumb break with the easy blackhawk draw. Just what I ordered and received it on time. No break-in required. Click the reviews tab to see customer's reviews. Holster features auto retention. To draw your firearm, the level 3 holster features a cover that you press to remove. Second step requires you to press in on the switch near the trigger guard area of the holster to release your firearm for drawing. Does this come with mounting equipment to mount to a utility belt? If not what do I need to order for mounting? It includes a duty belt loop for a 2.25" belt. Will this fit my 96 brigadier? I'm having a hard time finding a level 2 holster for my duty belt for work.. can you help. I like this style. Yes - Select "Beretta 96" as the fit.